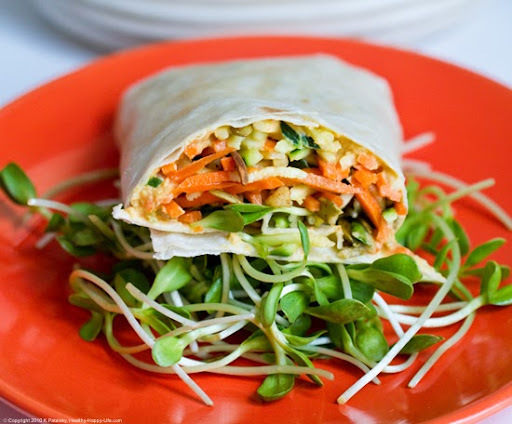 Sunny Spicy Wrap. Or Cheesy Quesadilla. What's your mood? Naughty or nice? 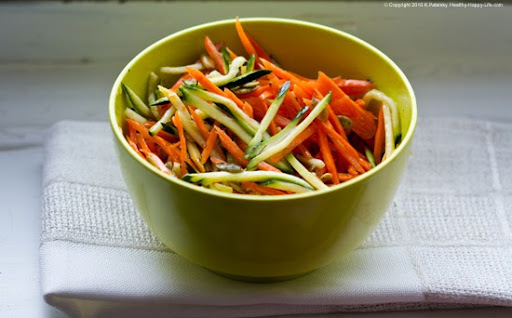 I have two easy, healthy vegan recipes to offer you - inspired by my base inspiration: Spicy Seeded Carrot and Zucchini Slaw. 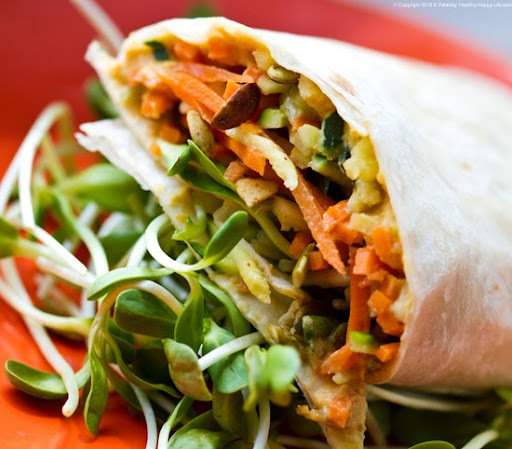 Feeling Nice: A raw spicy wrap filled with savory spicy hummus, crunchy maple/cider-marinated veggies and perky pumpkin seeds. 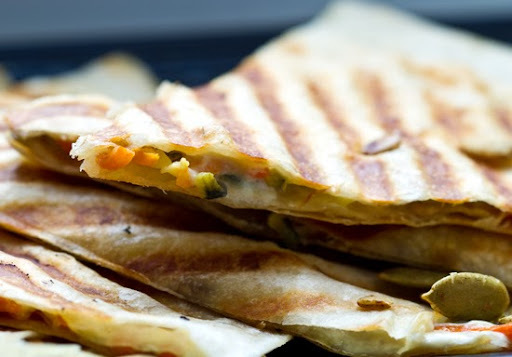 Feeling Naughty: My spicy slaw is slathered between two XL tortillas and smothered with Daiya cheese for a satisfying grilled quesadilla. Salsa-Guac Verde on the side. Make More Slaw Than You Need. 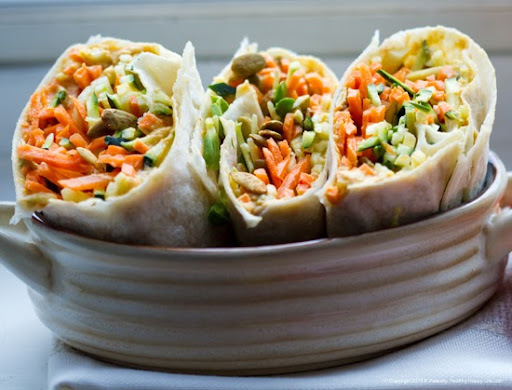 You'll want to make more than enough veggie slaw for your wraps or quesadilla - because it is a delicious side dish eaten alone. 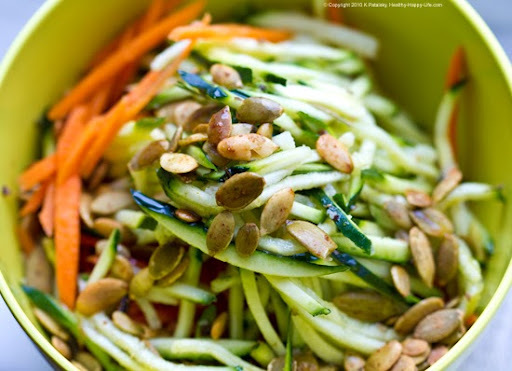 The tender zucchini strips paired with the crunchy sweet carrots, splash of apple cider vinegar, silky EVOO, sweet maple syrup and dash of sea salt and spicy pumpkin seeds. I found myself taking bites of the slaw even before I used it in my recipes. Spicy, sweet, refreshing, delicious! And healthy..
Good Salt. I can't stress enough the importance of investing in a few good gourmet salts for your kitchen pantry. Go with something coarse and naturally flavored with herbs/spices. A gourmet store should have what you need. Gray, pink and black salts are very popular and even trendy right now. 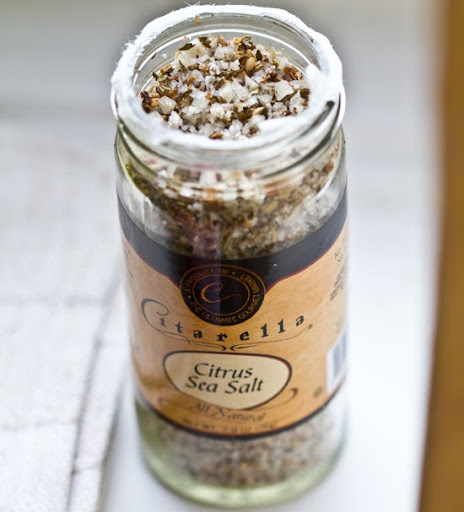 I used this citrus salt in this recipe and it intensified all the natural veggie flavors in my wrap. A little pinch of a quality salt goes a long way. optional: fold in some extra cayenne or harissa for extreme spiciness! 1. 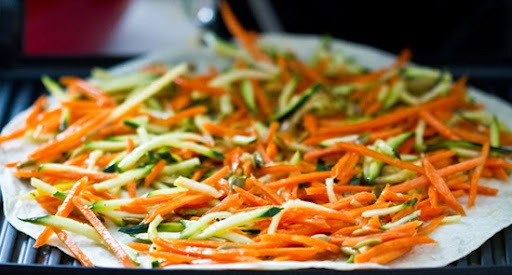 Prep all your veggies: carrots, zucchini. 2. Place all your slaw ingredients in a bowl and toss well. 3. 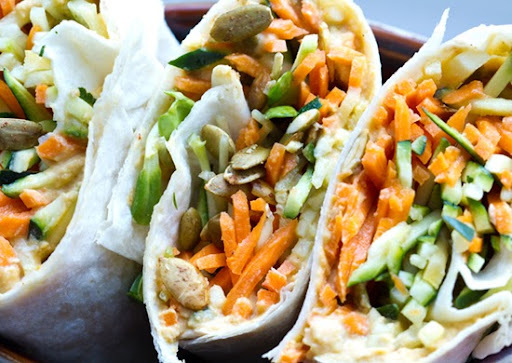 Spread your hummus over the tortilla wraps. 4. Add a nice portion of the slaw - add some sunflower sprouts too if you have them. 1. 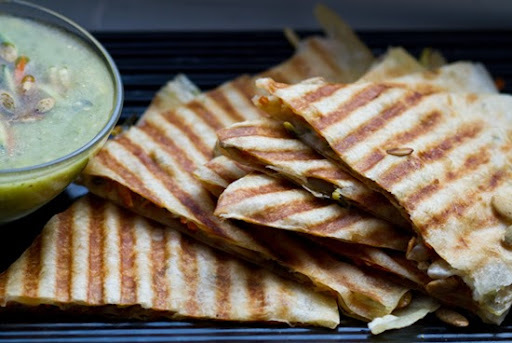 Place your first tortilla on your grill or panini press. 2. 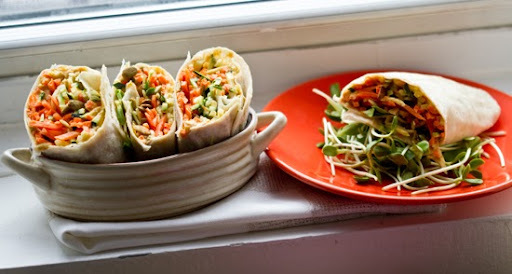 Thinly spread about a cup of slaw on the tortilla. 3. Add your cheese over that. 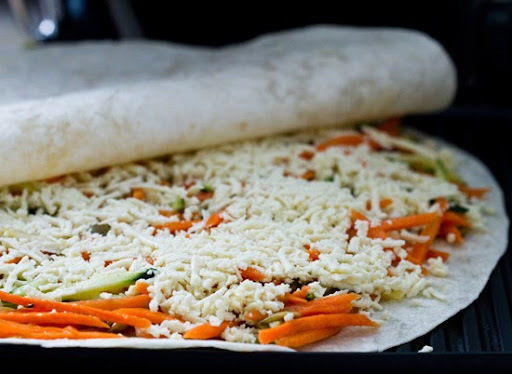 Rub a light layer of the excess slaw juices over top the outside of the tortilla. 4. 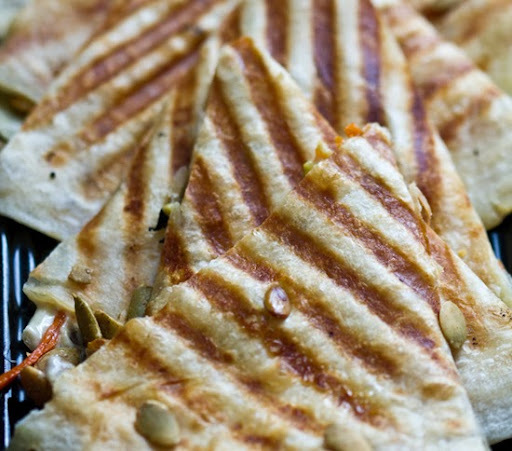 Place top tortilla on and grill until cheese melts and veggies are tender. 5. 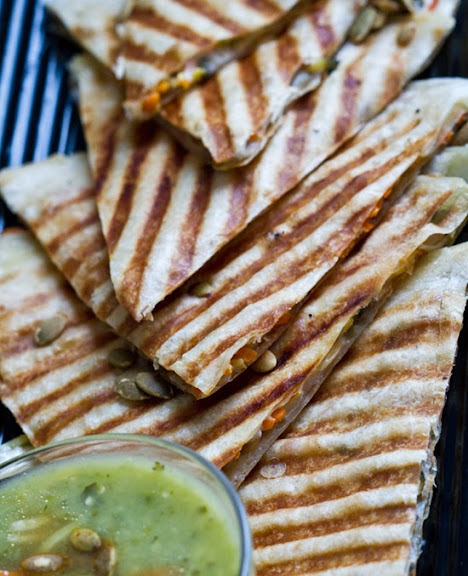 Slice into triangles, sprinkle with pumpkin seeds and serve with verde salsa-guac. Serve!